This was the day I was dreading happening. Would you be able to get in touch with them and ask them to send me more details to put on the website please, such as when this stuff will be released etc so I can inform all of the fans. I have received your e-mail today regarding the Hinge & Bracket Material on my website. I would love to work alongside the BBC on this if possible as this is what I have been trying to achieve for years with no luck, until now. I would much appreciate you sparing some of your time to maybe contacting me regarding the e-mail request so that I can have it clear for myself and the devoted fans. I have been in touch with George Logan and I am awaiting a response on this matter as it has been confirmed that the BBC sold the rights to a cable company in 2003/2004. I am not sure if this is correct, but this is what George told me when I first met him on the 10th January 2004. I of course welcome the fact that the "Dear Ladies" are FINALLY going to be officially released by a BBC distributor as this is what I and the yahoo group members have campaigned for since Patrick Died. Many of us have e-mailed the BBC for years regarding a release of these treasures but all we ever got told was to contact BBC Worldwide who then said there are no intentions to release this material. I even ventured into asking many companies to contact yourselves in regard to buying the copyrighted material and release it, but many of them didn't even bother answering and those that did, said No. So on the fact I got negatives from everybody we all got together to compile our recordings onto DVD which another fan originally started in 2004, he later gave it up as his work hours changed and family life came first. I have had no interest in making money from this, all we have ever wanted is to buy the official merchandise from the said companies. My main intentions were and are to keep the memory of Hinge & Bracket alive for all to see for years to come. With your help I hope this can still happen. All I request is that I can be kept informed of release dates of "Dear Ladies" and also any details of how we can get all of the Radio shows released too. It has taken years to get hold of fans recordings of these classic radio shows, and yes it has been nice to hear a few episodes on BBC7 which I have advertised on my site each time they were being aired. Please feel free to contact me on 01795 ** to talk further on this matter as you will agree it is in the fans and the BBC's best interest to support these official releases. May I just add that everybody that has bought these DVDs from me WILL buy official releases and I am more than willing to advertise this all for you. I was really shocked to read your email, but happily I think that the BBC are just saying don't sell the CDs and DVDs and aren't saying close the site down or even stop the club. They're just saying don't sell anything anymore. And even though they have obviously been tipped off... think of it this way. It's a triumph for you and your site. After all, if the Beeb do get the ladies released commercially it will be in no small part to all of your efforts. So if the price you pay for having them released nationally is that you stop selling Cds and DVDs, that's a major triumph that fans all over the UK, even the world, will benefit from. Lets make sure they stay true to their word and when they do you can sit back in pat yourself on the back for a job very well done. Hope all goes calmly with the BBC and they just realise that you and George have maintained the records . . . . . the BBC no doubt will go through their archives to see what they haven't got and what you have! If this is the case who's helping who to continue the good ladies work. You could point out, in a very H & B caring way, that the BBC did little of anything on Patrick's anniversary. You and the club have kept the "market" alive for the material. Good luck and many thanks for your efforts and loyalty to the club membership. The ladies will live on - perhaps the BBC might have the intelligence to utilize your knowledge to commence the "production" of BBC material. I have enjoyed Hinge and Bracket for many years. Attempts to obtain any of their work was near impossible until Paul Dunford commenced the official club. Through the dedication of Paul and the members of the club, he has been able to create an excellent archive of the Hinge & Bracket products, both BBC and others. Some of the fans have worked with, or been in associated with the Hinge and Bracket. Without their support the material would possibly have been lost for ever. If the archive processes in the BBC have been anything like those in Australia during the 1970's - 1980's, thousands of hours of excellent material has been lost as broadcasters decimated their archives. If was not for the dedication of the general public excellent material would have been lost for ever. Paul has performed his duties as the moderator of the Club with the full knowledge and support of George Logan (Evadne Hinge). Along with Paul's determination and the generous support by George Logan in providing material, the legend and material of Hinge & Bracket lives on. The club is not being run on a commercial basis. It a group of fans who have enjoyed the entertainment provided by "The Dear Ladies" and have a need to obtain copies of their work. Much of the collect has been donated by fans and other devotees of Hinge & Bracket. A plaque has been made and is now resides at Patrick's grave site. A bench has been built and installed at the grave site. In Australia, we have the National Film & Sound Archive. I assume you have a similar government / private organization. May I suggest that BBC utilize Paul and the members to officially make all the Hinge & Bracket performances and memorabilia preserved for all to enjoy. The club has many recordings that are not BBC orientated, e.g. Pantomimes etc. These need to be recorded officially for prosperity. There was no better performers than George & Patrick. Costume and set designs, visual and verbal material needs to be maintained for those who follow them. Well done Paul – it looks hopeful that the BBC may at last be going to do something about bringing back the Dear Ladies. Your persistence seems to have paid off. These things do happen though. For years I tried to find a copy of a very funny film called “Futtocks End” made by David Frost’s Paradine Films company and starring Ronny Barker. I bought an 8 mm film copy from eBay and an old film projector to show it – only to find that it was only “edited highlights” running for 14 minutes rather than the full film. Then I managed to get a DVD version which was very low quality from eBay again – taken from someone’s VCR recording – better than nothing. But I emailed the film company and their original distributor saying it was a pity it wasn’t available on DVD – and a few months later – it was made available and I now have a proper DVD and a good quality one at that – no flickering or jumping and crackling! So fans CAN sometimes win over big corporations. I'm so sorry to read of all this bother. Chin up. their permission. They haven't said that the site has to close down. why this one big happy family can't continue to chat and share ideas. supports you Paul - don't forget that! If it is not one hassle, it's another. I really do sympathise. You should feel very proud of everything you've achieved. communicating about many things. It would be a real shame to take that away. 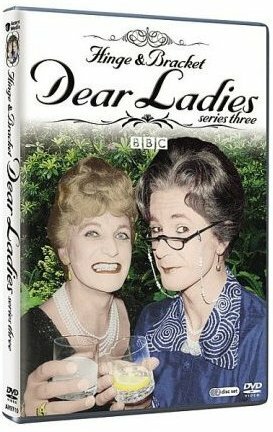 as a member of the Hinge and Bracket Official website, I was delighted to hear that the BBC finally intend to commercially release some of the Dear Ladies material of which copyright is owned by the BBC. Do you have any idea of what form these will be released and indeed which material specifically. I'm glad to hear that you are happy for the website to continue, Paul has worked very hard for us fans and its been great to relive some happy memories. Well done Paul for EVERYTHING you have done and will do in the future - long live H and B FOREVER!! I have written to Mr Webley (copy below) - I hope this helps. Good news that the Beeb do intend to eventually put some of our stuff out commercially - that is, if indeed they do! If so, I would say it is a large measure due to your hard work! Needless to say, you must follow Mr Webley's instructions regarding stopping selling the BBC related stuff immediately, although of course you have my permission to continue with anything else that doesn't infringe the Beeb's copyright. You also have my permission to put this email on the site, if you think it would be of interest. I hope you and Ryner are both well, and settling into the new house. Hope to see you soon. and on television between 1974 and 2000. Needless to say, I have advised Mr Dunford to comply with your instructions regarding his distribution of this material forthwith. I would like to say that I know Mr Dunford personally, and can assure you that his work on behalf of Hinge and Bracket has been in no way motivated by profit - I understand that his charges just about cover the cost of postage, blank media and packaging . He has also raised money to provide a memorial bench close to the site of Mr Fyffe's grave, and has worked very hard for no material reward to continue promoting the name and work of Hinge and Bracket during a period when no-one else seemed to be very interested. I am pleased to learn from your letter that the BBC now intend to release some of this material commercially. Would you be kind enough to let Mr Dunford know any details you may have at present, in order that he can put the information on his web site for the benefit of those who are interested? It would be most appreciated. I'm sure you are aware that not all of the material that Mr Dunford sells originates with the BBC - some is taken from private recordings made by myself and Mr Fyffe over the 30 years of our career as Hinge and Bracket, and Mr Dunford has my permission to copy and distribute this in any way he sees fit. Thank you very much for your email, and by copy thank you to all the fans who sent in supportive messages and, of course, to Mr Logan. Thank you also for confirming that you have removed all BBC material from your website. Again, we were delighted to see how much support and enthusiasm there is for the characters Hinge and Bracket and we are very excited about the impending release of the material. I am afraid that I am not currently in a position to give many details about what will be released and when. All I can tell you at the moment is that BBC Worldwide is in negotiations with some distribution companies who are very interested in the "Dear Ladies" series. The companies are also keen to distribute the Gala Evenings. While we are getting there, it will take time for the distributor who wins the contract to begin making the material available commercially. As it will not be the BBC who will be distributing the shows, we cannot make any promises for the third party distributor, but I cannot see any reason why they would not want to take full advantage of the resources that your site offers and the direct access to so many fans and potential customers. We will certainly pass details of your website on to them and ask that they contact you. In the meantime, we will keep you informed of progress so that you can let all of the fans know what is happening. I was wondering if it would be a good idea to create a waiting list of people who would be interested in the programmes so that we can give this to the distributor so that they ensure everyone gets a copy as soon as possible? If you think that this would be useful, please either place such a list on your website or email it to me and I will forward it on. I am sorry that I cannot be more precise or give more details but this is all we know at present. We will be in touch as soon as we hear anything further. But in the meantime, if you have any questions please do not hesitate to contact me either by email or by telephone on 020 8008 1942. Many thanks again for all your support, co-operation and hard work. We are all so excited about the future release of Dear Ladies and as I have stated before I WILL advertise it on my site for you so you get maximum sales from it. I am just about to set up a NEW petition regarding the radio shows, and also one to get peoples details to pass on, but I do need an e-mail address so fans can add their name to a list. If you could send me the address I can do that. I also need an e-mail address so that the BBC get a copy of each new petition entry if they need this as well. I really am so pleased this is finally going to happen and I would love to be kept informed with details of who gets the contract and when production will start etc, and I will be pleased to hear from the companies involved as I may have material here they can use and re master. Thank you so much for your earlier reply. Thanks again for you co-operation and support. The person you need to contact is Rupert Waring who works in BBC Worldwide. His email address is rupert.waring@bbc.co.uk. Failing that, or if there is anything you need, please do not hesitate to contact me. I am not part of the commercial deals, but I may be able to help. 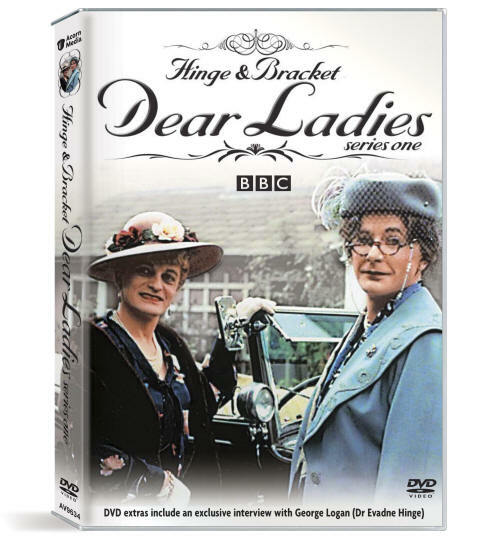 I understand from Mr Tom Webley that in the pipeline is a release of the Hinge & Bracket TV Series, "Dear Ladies" on DVD when you have sorted out a contract with a supplier. I would just like to let you know that there is a huge demand for the release of this material and we look forward in anticipation to it being released officially. I have told Mr Webley that I will give full support and advertising to this project on my website. I have also had a petition running for nearly a year to which the BBC have noticed recently and also I have just set up a new one to thank the BBC for finally getting round to getting this stuff released. I have also given your e-mail address to all of the fans who will be writing in pledging their support to this project. Please could you keep me informed of how things are going with this and details so I can put it on the site for everyone to see, as we are all very excited about this happening at last. We are also hoping that the BBC will release "The Enchanting World Of Hinge & Bracket" & "The Random Jottings Of Hinge & Bracket" radio shows on CD as you did with "Round The Horne" etc, this will also have a huge demand. Could you please keep an eye on the petitions via my website and pass on to whoever needs the details. Thank you for your email, Tom Webley has been in touch with me and explained the situation. We are indeed currently discussing Dear Ladies and other Hinge and Bracket titles with with potential distributors, and we very much hope that this will result in a release. I will certainly keep you informed of our progress and will also look into the the radio titles you mention. In the meantime all pledges of support are most welcome. delighted to hear as a Hinge and Bracket fan club member that there are plans to release this material. This is indeed excellent news and I think thanks must go to Paul Dunford for setting up the club with George Logan's approval and keeping us fans informed. I, along with many other members I'm sure look forward to news of the releases. Thanks for the update and great to see there is so much interest from your supporters. At this stage we are still in the somewhat lengthy process of examining the costs of a release. Although we are very much expecting a successful outcome, we will not be in a position to give the distributors the go-ahead until this stage is complete. As soon as we have any more news I will certainly let you know. Just for your information 2 Entertain will not be the distributors of this title, so the best place to come for updates is myself. Please feel free to pass this on to the group, but rest assured I will be in touch with any developments. I work with a company called Acorn Media and I am delighted to confirm that we have successfully licensed from BBC the rights to Dear Ladies: Series One and the seven concerts filmed by the BBC between 1978 and 1981. We will be releasing these on two DVDs in the near future. The exact release date is dependent upon final confirmation from BBC, however we hope to be able to release at least one of these DVDs this side of Christmas. George Logan has very kindly agreed to allow us to film two short interviews with him as an extra feature for the DVDs. When we went to the BBC picture archives we found they hold very few images and the ones they do have are black and white which are not suitable for use as cover art. I see from your website that you have many images of Hinge and Bracket and we wondered whether you would be willing to allow us to use any images for the purpose of the DVD sleeves. We are also hoping to include biographies of both George Logan and Patrick Fyffe as extra features. I wonder whether you would be so kind as to help us with information for these biographies as I believe you are the oracle on all things Hinge and Bracket. Thank you so much for getting in touch regarding the Dear Ladies, it is something I have longed to see happen for many many years. It is very exciting for me that this is finally going to happen, and I will be pleased to help out in any way I can. I will advertise these on my website for you when they are near release etc. When will you be doing the interview, as my partner and I are invited over to France to stay with George & Louie when we can get time, I am assuming you will be going to France to film, and we would dearly love to be there to see the background of this happening so I can report it to the fans via the website. It would be fantastic to give the fans details of the making of the interviews and to get some pictures for them to see on the site. It will be an honour to help out with anything you need to go on these DVD's, pictures etc, as George endorsed my website in 2004 and I have spent hundreds of hours giving people all the information they have wanted to hear, so it will be a great thing to add on to the DVDs too. I hope you have seen the 2 petitions I have got on the website, which made the BBC get in touch and realise there is a need for the Dear Ladies to be reborn on DVD. I helped raise lots of money to pay for the bench we got put up at Taunton Deane Crematorium in 2006, and also the costs towards the correcting of his mis-spelt headstone. It is wonderful knowing that finally a company is going to release these officially to all the devoted fans, and it is a fitting tribute to Patrick, and I am sure he will be very pleased. My wishes go with you on this excellent venture, please do not hesitate to get in touch either by e-mail or in person. Alternatively you could call me if you need to talk. I'm very pleased for you, I had wanted to let you know about the release myself but we thought Acorn should have that pleasure! I look forward to seeing this series when it hits the shelves. Steve Allen mentions the great news of the DVD releases on his show on Sunday 24th June. Good old Steve - bless his heart - he always comes through. emails from Richard & Faye. I just wanted to let you know that I have received the DVD you sent through. Many thanks for that - it's making interesting and entertaining viewing. Also, I wanted to see if you have received any response yet to the request for questions from the fan-base. If you have had replies would it be possible to get these over to me by the end of tomorrow so I can begin to get a feel of what the fans may like to know. Thanks again Paul and I look forward to hearing from you. Please accept my apologies for the delay in replying. We have been extremely busy and I am just catching up! I believe Richard Adamson has been in touch regarding questions for the interview – we look forward to seeing his final selection. Thank you for sending through the sound clip of Steve Allen’s show mentioning the DVDs, it is good to hear we are getting publicity already. Thank you for your help so far. We will be in touch soon regarding any other information we require. I replied and gave him my number, but forgot to pick my phone up as I went out and missed the call, DOH! Many thanks for getting back to me so quickly. I have left a brief message on your mobile and will try calling again on Monday. If there's a good time to catch you on Monday please just drop me a quick reply to let me know. Also if there's any information you wish to send through over the weekend or anything you feel would be worth me knowing before I call please do not hesitate to e-mail me. Many thanks and I'll hopefully speak to you on Monday. From Richard Adamson at Phoenix Film & Television Productions Ltd.
Also this came through from Richard Adamson at Phoenix Film & Television Productions Ltd. I have been given your e-mail address by Faye Baker at Acorn Media with regard to the forthcoming Hinge & Bracket DVD releases. I will be producing the DVD extras and feel that, given your remarkable knowledge and dedication to the Hinge & Bracket cause, it would be worth us speaking/e-mailing so I can identify what would be of greatest value to the fans. If you have a contact tel. no. that you would be happy for me to call you on we can perhaps speak next week. If not, then hopefully we can communicate via e-mail. Many thanks Paul and I look forward to hearing from you. Thank you also for your prompt reply. I have asked George for any proper & correct biographies of both of them, which I will send to you as soon as I get them. I have also asked him if he has anymore slides/negatives that I can scan for you to use or pictures I can send on to you. Are there any pictures on the site you would like to use? If you have a look in the Gallery and right click and save the thumbnail pictures and e-mail them to me, I will see if I have got the full size pictures and will put any of them onto disc for you to use. Would you be putting the H&B official website address on the DVDs too? I would love to help out in anyway possible on this venture as I have campaigned for years to see the "Dear Ladies" Series' released on DVD. I would love to put my two penneth in to say a big thank you to George & Patrick and the BBC for finally going ahead and realising that Hinge & Bracket were an act that can never be replaced and should live on forever, hence all my hard work over the years. I have also asked George if it is ok for both of us to go over and stay with them when the filming is done. Would you also be filming a bit at Patrick's Grave in Taunton to show the Grave and Bench we all donated? It would be good if George could come over for that as he hasn't seen the grave yet, and it would be such a nice thing for him to finally see it. I can assure you that Steve Allen on LBC 97.3 will be plugging these DVDs for you and the run up to the releases. He always mentions H&B and my site. I have added a link on the website to yours and a copy of the e-mail you sent yesterday for fans to read, and I can tell you the fan club members and yahoo group members are absolutely delighted. I will also add everything on the Blog that they can read, I can assure you of good sales of these DVDs, so make sure you have enough made up, and don't stop making them after a little while as the interest is always going to be there. I also have the 5 Specials DVDs which I produce, so if you ever need anything to add as special features on the DVDs do let me know if there is anything you wish to use. I am looking forward to hearing from you both. I e-mailed Richard Adamson the questions for him to think about asking when he interviews George. Many thanks for sending through the questions - there's some nice ones in there that I hadn't thought of myself so I'll see how I may be able to incorporate them, but for the large part what the fans appear to want to know are things I want to know myself, which is good . With regards to photos etc. I've gone through the gallery and there's some excellent ones in there. I'll pull together a list of any that I may want to use and will be back in touch. I hope you are well. 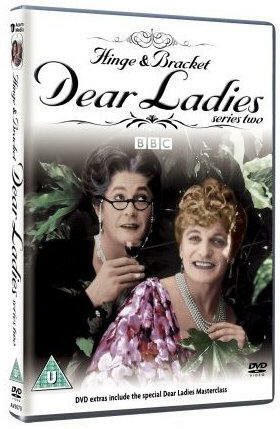 Please find attached the 3D image of the DVD release for Series One of Dear Ladies. This has now been approved by everyone and so you are more than welcome to use this on your site. Thank you for sending me the mp3 of the interview with George Logan. 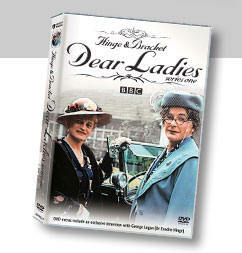 We too are delighted to see the release of Dear Ladies Series 1, and thank you for your continuing support. I'm sure there are many fans who will be grateful to you for part in campaigning to make this release happen. Regarding the Hinge & Bracket concerts I can tell you that Acorn have picked up the rights to these. 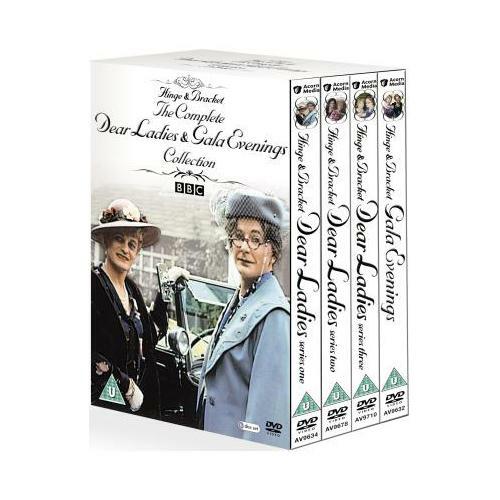 Regarding Dear Ladies series 2 and 3 I suspect Acorn will wait and see how sales of the first series go. We will have the cover art for the Gala Evenings soon and it is being released in February. Initial sales on series one are very good so fingers crossed it keeps going! I hope you are well. Apologies for the delay in replying I have been unwell and so not in the office. 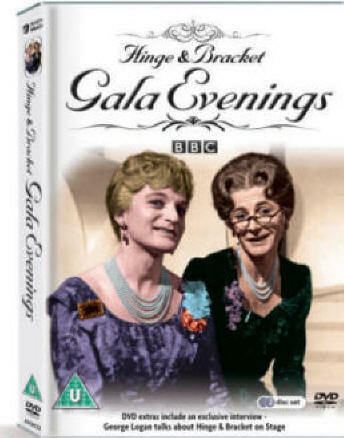 I have attached a copy of the sleeve for the Gala Evenings DVD so you can use the approved copy on the back. The release date for this is the 4th February and it is a double DVD priced at £19.99. Thank you very much for putting this on your site and for the continued support for Series 1. I don’t appear to have a huge amount of information to hand on the Gala Evenings, I have transcribed the back of the inlay for you below, this may be of some use to you. After many years of entertaining the inhabitants of Stackton Tressel with their Gala Concerts, Dame Hilda Bracket and Dr. Evadne Hinge were thrilled to be invited by the BBC to take their very individual style of concert performances to a wider audience. These events, recorded between 1977 and 1981 at the Royal Hall, Harrogate and the Opera House, Buxton feature the ladies with full orchestral and choral support. The ladies perform a wide range of music from Gilbert and Sullivan to Verdi. Of course, Dr Hinge has a few pithy remarks to make, while Dame Hilda remains her usual irrepressible self. I am sure this will be just as popular as Series One of Dear ladies. Thought you'd like to know Acorn have announced the release of Series Two for Dear Ladies as Monday the 8th of September 2008. You might like to add the news to your website. Wow that was quick – the deal was only signed yesterday! This release date is very tentative as it is dependent on clearances etc but as soon as we know any more or have artwork we will let you know. No worries. In fact, HMV have been very quick off the mark this time around, and one can pre-order the title at a very fair price already. Have you got the front cover art for Dear Ladies - Series Two yet? I would like to get it advertised on the website for you as soon as I can. Hope the DVD sales for Series one and Gala Evenings have gone well, still advertising it for you on the site. I hope you are well. We don’t have the cover art for series 2 yet but we will let you have it as soon as we do. Series one and Gala Evenings are still going strong! Thank you so much to the BBC and Acorn Media and all of the fans that signed the petitions.